Trash pickup day is on Wednesday for areas east of Hwy. 61-67, (City Hall side), Riverview, Mississippi, Spring/Elm and Commercial. If you live on the QT side or Cracker Barrel side, trash pickup day is Tuesday; " The Prairies", "Providence" or "Stonewater", trash pickup is on Fridays. Trash must be set out by 6:00 AM on scheduled pick-up days. Limbs will be picked up if they are bundled together and are no longer than 4 foot in length. Yard waste must be set out by 6:00 AM on scheduled pick-up days. Bulk items will be picked up on Wednesday's and on an "on call" basis. Contact City Hall before the close of business on the Tuesday before collection, items that will not be picked up are as follows: tires, car parts, motors, oil, broken glass and paint cans. Bulk items must be set out by 6:00 AM on scheduled pick-up days. Receive free towing and a tax deduction when you donate your car to Wheels For Wishes, benefiting Make-A-Wish Missouri. Republic Services offers one container, many benefits. We believe that recycling at home should be effortless. All you have to do is place your recyclables in the container, and we’ll do the rest. Our advanced sorting equipment ensures your recyclables are processed responsibly and reliably. From efficient curbside pickup to thorough sorting systems, we’re making our planet better. Recyclable items should be placed curbside by 6:00 AM on each Monday morning! Tin & Steel Cans including empty Aerosol cans and containers. #2 HDPE - milk & juice jugs, detergent & fabric softener containers, etc. #3 PVC - narrow neck containers: health & beauty aid products, household cleaners, etc. #4 LDPE - grocery containers: margarine tubs, frozen desert cups, etc. #5 PP - grocery containers: yogurt cups, syrup & ketchup bottles, etc. 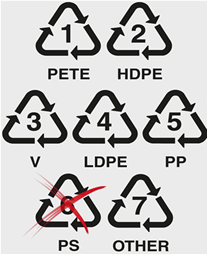 Basically, any plastic that has a number inside the "Chasing Arrows" recycle logo. ALL CONTAINERS MUST BE RINSED CLEAN OF ANY TYPE OF LIQUID OR SOLIDS. Cardboard, chipboard (cereal, cake & food mix boxes, gift boxes, soda & beer carrier cases), Pizza Boxes (minor food residue is ok, no crust or pieces), etc. Insecticide, herbicide or hazardous chemical containers. Covered recycle totes are available by calling the Water Department at 636 479-3777. City Hall is open from 8:30 AM to 4:30 PM, Monday through Friday. The Water Department telephone number is 636-479-3777. Any questions or concerns, please call Republic Services at 1-573-624-8135 or the Water Department.